Over the course of more than a year, ProPublica reviewed thousands of inspection reports and interviewed more than 100 patients, advocates, doctors, policy makers, researchers and industry experts to get a grasp on American dialysis. The findings were bleak: At clinics from coast to coast, patients commonly receive treatment in settings that are unsanitary and prone to perilous lapses in care. Regulators have few tools and little will to enforce quality standards. Industry consolidation has left patients with fewer choices of provider. The government has withheld critical data about clinics' performance from patients, the very people who need it most. Meanwhile, the two corporate chains that dominate the dialysis-care system are consistently profitable, together making about $2 billion in operating profits a year. One reason the system's problems have evolved out of the health care spotlight is that kidney failure disproportionately afflicts minorities and the dispossessed. But given a patient pool growing by 3 percent a year and the outsize 6 percent bite that the kidney program takes from the Medicare budget, we ignore dialysis at our own risk. "We're offering our patients a therapy we wouldn't accept for ourselves," said Dr. Tom F. Parker III, a Dallas nephrologist and national advocate for better care. More and more leaders in the field, he said, "are starting to say this isn't sufficient." 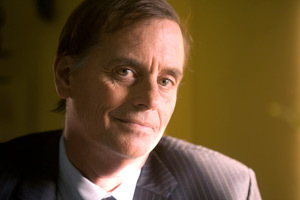 Henry Baer went in for his third dialysis treatment on New Year's Eve day in 2005. It turned out to be his last. He was only 39, but years of diabetes and high blood pressure had caused Baer's kidneys to shut down. Built-up waste and fluid were causing his limbs to swell and making him short of breath. He was sent for what's called in-center hemodialysis , the most common type of dialysis, at a beige-toned clinic near his home in Prescott Valley, Ariz.
His first two sessions were pretty normal. A patient-care technician hooked Baer to a machine the size of a filing cabinet, connecting it with plastic tubing to the catheter in his chest. He sat in a lounge chair, still as stone, for about four hours as the machine, whirring gently, moved his blood through a specialized filter, then returned it, cleansed of toxins. It was uncomfortable and boring. "Sis, this isn't for me," he told his older sister, Karen Gable, vowing to make himself a viable candidate for a kidney transplant. Just over two hours into his next session, Baer's incoming bloodline "became disconnected," a federal inspection report  says. The attending technician panicked, "yelling and screaming hysterically." Blood sprayed onto Baer's shirt, pants, arms and hands. Then, "contrary to emergency standing orders," the report continued, she reconnected the line to Baer's catheter, infusing him with "potentially contaminated blood." By the time Mike Wright, Baer's boss at a local car dealership, picked Baer up after the treatment, he was complaining of nausea. What happened to Baer was a worst-case scenario. Yet in some ways it is symptomatic of how dialysis is delivered. Medical supervision is minimal. Clinics must have board-certified physicians as medical directors, but usually have no doctor on site, and some struggle to meet the federal requirement of at least one full-time registered nurse. Technicians, who can start with just a high-school diploma and an in-house course (though they are later required to pass a state or national certification test), have been the field's workhorses for a generation. Medicare sets no staffing ratios for dialysis centers, and most states don't either. Although some clinics are orderly and expert -- attentive not only to patients' health, but also to their dignity -- others are run like factories, turning over three shifts of patients a day, sometimes four. Safety experts say technicians shouldn't monitor more than four patients at once, but some operators save money by stretching them further. The pace can be so intense, inspections show, that clinics have allowed patients to soil themselves rather than interrupt dialysis for a bathroom break. One technician said he quit his job at a large Colorado clinic because he often had to juggle six patients or more. "The last two years, I was just getting old," he said. Conditions within clinics are sometimes shockingly poor. ProPublica examined inspection records for more than 1,500 clinics in California, New York, North Carolina, Ohio, Pennsylvania and Texas from 2002 to 2009. Surveyors came across filthy or unsafe conditions in almost half the units they checked. At some, they found blood encrusted in the folds of patients' treatment chairs or spattered on walls, floors or ceiling tiles. Ants were so common at a unit in Durham, N.C., that when a patient complained, a staffer just handed him a can of bug spray. Hundreds of clinics were cited for infection-control breaches that exposed patients to hepatitis, staph, tuberculosis and HIV. A Manhattan center closed in 2008 after cross-contamination infected three patients with hepatitis C within six months. Prescription errors were common: 60 clinics had at least five citations for them. In dozens of instances, patients died or were hospitalized after suffering hemorrhages like Baer's, when dialysis needles or tubing dislodged and staffers failed to adhere to safety guidelines. Providers  say  they work hard to meet or exceed government standards, correcting deficiencies quickly when they surface and sometimes employing their own internal auditing programs. "You will find cases where things go wrong, but it's a small percent when you consider all of the hundreds of thousands of treatments every day," said Diane Wish, the CEO of a small Ohio dialysis chain and president of the National Renal Administrators Association, the group that represents dialysis facility managers. But patient advocates say conditions in some clinics have been problematic for so long that everyone in the system has come to accept it. "It's become ingrained that dialysis is expensive and dangerous and has terrible outcomes," said Bill Peckham, a patient known widely for his blog, Dialysis From the Sharp End of the Needle . "Once you're there, God help you. What do you expect? You're on dialysis." Dialysis entered the American consciousness in the early 1960s as the country's signature example of medical rationing. In those days, kidney disease killed about 100,000 people a year. Chronic dialysis was possible, thanks to two inventions: the artificial-kidney machine developed by the Dutch doctor Willem Kolff during World War II and a vascular-access device designed by Belding Scribner, a pioneering Seattle physician who opened the first outpatient dialysis center in the United States. But treatments were expensive, and most private insurers would not pay for them. At Scribner's medical center, the Life or Death Committee parceled out the few slots, weighing not only the health of patients and their income, but also their perceived social worth. News reports about the committee's work sparked one of the earliest national debates over the right to care and put pressure on the government to step in. A turning point came when Shep Glazer, vice president of the largest patient group, made an emotional appeal to the House Ways and Means Committee as he underwent dialysis on the hearing-room floor. "If your kidneys failed tomorrow, wouldn't you want the opportunity to live?" asked the 43-year-old father of two. "Wouldn't you want to see your children grow up?" The measure  establishing taxpayer funding for treatment of end-stage renal disease, signed into law by President Richard M. Nixon, was expansive, and its lopsided, bipartisan approval reflected the times. Many lawmakers -- even conservatives -- thought the United States would adopt a European-style national health care system. Also, the program that took effect in July 1973 was expected to have about 35,000 patients and cost about $1 billion in its 10th year. Those estimates came to seem almost laughable. The number of dialysis patients surpassed 35,000 by 1977 and has gone up from there. The growth reflected not only lower-than-expected transplant rates and the spread of diabetes, but also positive trends, like better cardiac care. With Americans living long enough for their kidneys to fail and no disqualifying conditions for the program, even the oldest and sickest patients increasingly were prescribed dialysis. Upwards of 100,000 now start treatment each year. "It's been a perfect example of that line, 'Build it and they will come,'" said Dr. Jay Wish, director of dialysis services for University Hospitals Case Medical Center in Cleveland. Because the kidney program absorbed that unforeseen wave -- and thus prolonged so many lives -- some call it one of the great success stories of modern medicine. Still, the annual bill for the program quickly outpaced early projections, surging past $1 billion within six years. Per-patient expenditures were expected to drop as technology advanced. Instead they have risen steadily, as drug and hospitalization costs grew for the program's increasingly frail clientele. Medicare has struggled to enforce quality standards for dialysis while meeting its prime directive of providing universal access. As the medical community's understanding of kidney disease grew, the government set biochemical targets for improving care. Clinics got better at hitting them, but overall rates of death and hospitalization have seen little change. And Medicare's record of making sure that clinics meet health and safety standards has been spotty. Clinics are supposed to be inspected once every three years on average, but as of October, almost one in 10 hadn't had a top-to-bottom check in at least five years, as shown by data from the Centers for Medicare and Medicaid Services  (known as CMS). About 250 facilities hadn't had a full recertification inspection in seven years or more. Nursing homes, by contrast, must be inspected once every 15 months, and in 2006, CMS reported that 99.9 percent had been. Even when inspectors find that clinics are not meeting government standards, the consequences are seldom meaningful. CMS can demand that facilities submit correction plans, but it cannot fine violators as it can nursing homes. The agency almost never imposes its toughest sanction -- termination from Medicare -- because clinic closures could hinder access to care. From 2000 to 2008, the agency barred just 16 dialysis facilities; federal regulations set no limits on how many violations are too many. "It's a judgment call," said Jan Tarantino, deputy director of CMS's survey-and-certification group. When the Memphis University Dialysis Center was terminated from Medicare in June 2007, the step had been at least four years in the making. During that time, the clinic was flagged for dangerous conditions, inadequate care, higher-than-expected mortality rates and subpar clinical results. CMS threatened to yank the unit's certification in March 2006 and again the following year. Both times, however, even though inspectors continued to find problems, the agency allowed the clinic to stay open. In April 2007, nine days after CMS sent the center a letter confirming that it was back in compliance, 66-year-old James "Tug" McMurry came in for treatment. When he had slow blood flow after being given his regular dose of blood thinner, staffers administered doses of a clot-dissolving medicine, according to a CMS survey . Later, a nurse told inspectors that a doctor had given a verbal order to administer the drug, but the doctor denied it, writing  "This order was not given by me" on a form. 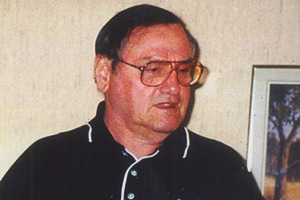 McMurry called one of his sisters, Betty Tindall, on his way home that day. "He said, 'They don't know what they're doing up there,'" Tindall recalled. A couple of hours later, McMurry's neighbor heard him bang on the shared wall between their apartments. "Help! Help!" he yelled. Paramedics found him slumped in a chair, vomiting. Tests at the hospital showed McMurry had suffered a devastating brain hemorrhage. By the time family members made it to his bedside, he was in an irreversible coma. CMS officials disputed the idea that they had acted too slowly. "Please understand that this is not an easy decision," said Jessica Jenkins, a spokeswoman for the regional office that handled the matter. "We're not in the business of putting facilities out of business." Problems like those that regulators found in McMurry's clinic are partly rooted in economics. The government's payment policies for dialysis have created financial incentives that, in some ways, have worked against better patient care, while enabling for-profit corporations to dominate the business. When the end-stage-renal-disease program began, hospitals provided most of the care on a nonprofit basis. But spurred by the guarantee of Medicare money, the marketplace met the growing demand for services through the expansion of for-profit companies. Today, more than 80 percent of the nation's 5,000 clinics are for-profit. Almost two-thirds of all clinics are operated by two chains: Colorado-based DaVita and Fresenius, a subsidiary of a German corporation that is the leading maker of dialysis machines and supplies. From the start, the government's payment rules rewarded efficiency. Medicare set a rate for dialysis treatments, originally $138 per session, and covered a maximum of three treatments a week for most patients. Providers could keep whatever they didn't spend on care. There were no penalties for poor results and no bonuses for good ones. Unlike other Medicare rates, the payment wasn't adjusted upward for inflation. Lawmakers cut the base rate to about $123 per treatment in 1983, after the program's cost came in higher than expected and audits showed providers averaging profits of more than 20 percent. Dialysis companies responded like any other business facing a drop in prices, said Philip J. Held, a nationally recognized researcher on kidney disease and an economist by training. They chopped expenses by shortening treatments, thinning staff and assigning tasks once done by nurses to unlicensed technicians. Some reused dialyzers, the filters that clean a patient's blood. "It changed the nature of the service," Held said of the rate cut. "You get what you pay for. The price was lower, but the product was dramatically different." The government created another perverse incentive by allowing clinics to bill Medicare separately for certain medications, reimbursing them at a markup over what they paid drug makers. Dialysis companies embraced the opportunity: Doses of Epogen, prescribed to treat anemia, and similar medications tripled between 1989 and 2005, becoming Medicare's single largest pharmaceutical expense. "Their core business became giving patients injectable drugs," said Richard A. Hirth, a professor of health management and policy at the University of Michigan School of Public Health. "Dialysis was just the loss leader that got [patients] in the door." Though lucrative for clinics, the drug boom -- much like the service cuts -- may have undermined patient care. A 2006 study showed that patients treated with higher doses of Procrit, a medication similar to Epogen, were at greater risk for heart problems and death than those who got lower doses. As a whole, the government's payment rules have given big providers, with their economies of scale and purchasing power, a financial edge over smaller ones, spurring consolidation. DaVita and Fresenius each now have at least 1,500 clinics and more than 120,000 patients in the United States. No other operator has more than 300 clinics. The chains say their deep pockets support quality initiatives that smaller providers can't match. "One of the advantages of being large ... is that you can invest in trying new things and being innovative," said Dr. Allen Nissenson, DaVita's chief medical officer. The Big Two are evolving into one-stop-shopping outlets for dialysis-related services: They run labs, pharmacies and clinics that specialize in vascular access. They have moved into the home-dialysis market and sell drugs used by dialysis patients. In 2009, the dialysis giants booked combined North American operating profits of $2.2 billion, their most ever. In public financial filings, the companies say Medicare payments do not fully cover the cost of treatments and attribute much of their profit to the small minority of patients covered by private insurers, who pay substantially higher rates. DaVita says its margins are slimmer than those of the health care sector overall. In a March 2010 report  (PDF), the independent Medicare Payment Advisory Commission judged pay for dialysis and related services to be adequate, calculating that in 2008, one-quarter of U.S. clinics had Medicare margins of at least 13 percent while another quarter lost money. The two largest providers averaged Medicare margins of 4 percent, the commission found, more than twice that of all others. Some smaller operators are struggling. For the past several years, the Independent Dialysis Foundation, a nonprofit with nine clinics in Maryland, has run in the red. The founder, Dr. John Sadler, a pioneer in dialysis, said he has refused offers to sell because he believes independent operators offer a crucial alternative to chains. But Sadler admitted to a growing sense of futility. "Perhaps people like me are dinosaurs," he said. "I've always thought our focus on patients, not profits, was important." Many within the dialysis world share Sadler's uneasiness with the dominance of for-profit providers overall and chains in particular. Over the past decade, stacks of competing studies have attempted to parse whether the quality of care at for-profit centers is equal to that at nonprofit centers, with no clear-cut answer. The expanding grip of DaVita and Fresenius may make such debates moot. Though the U.S. has more dialysis clinics than ever, patients don't necessarily have more choice. "It's Coke and Pepsi," said Joseph Atkins, who has been in the industry for 37 years as a technician, nurse, clinic owner, and consultant. "And in some places, it can be Coke or Pepsi." Even as government policies have encouraged the spread of corporate dialysis, they have largely denied consumers the chance to use market power to push for better care. Because Medicare is the dominant payer, it has information about dialysis centers that doesn't exist for other medical providers. Yet the Centers for Medicare and Medicaid Services has not made public key measures such as clinics' rates of mortality, hospitalization for infection and transplantation. Regulators know how dialysis units perform by these yardsticks. So far, patients don't. Mark Schlesinger, a professor at the Yale School of Public Health, says the program has squandered an opportunity to be a model of patient empowerment. "In some ways, [dialysis] is where Medicare has the biggest footprint, but it's always been kind of a backwater," he said. "There's a perception that these patients won't take advantage of the opportunities." ProPublica first asked CMS for the clinic-specific outcome data it collects -- at taxpayer expense -- two years ago under the Freedom of Information Act. The agency declined to say whether it would release the material until last week, as this story neared publication. It subsequently has provided reports for all clinics for 2002 to 2010. ProPublica is reviewing the data and plans to make it available for patients, researchers and the general public. CMS's Dialysis Facility Compare website  posts a handful of measures, including one for mortality, but does not give hard numbers. Instead, it categorizes patient-survival rates as "better than expected," "worse than expected" or "as expected." "Mortality is hard for individuals to face," said Thomas Dudley, who oversees Dialysis Facility Compare. "You don't want to scare people away." Peckham, the patient-advocacy blogger, scoffed at this. "It infantilizes people to say, 'We don't want to burden you with information and facts,'" he said. Innovative Renal Care and Midtown Kidney Center, clinics about two miles apart in Houston, had similar stats on Dialysis Facility Compare in 2007, including "as expected" survival rates. But the full data show that Innovative Renal's average annual death rate -- after factoring in patient demographics and complicating conditions -- was 34 percent higher than expected . Midtown's average rate was 15 percent lower than expected . Dialysis Facility Compare has since changed Innovative's survival rating to "worse than expected," but how much worse? The unpublished 2009 data reveal that the clinic performed more poorly, versus expectations, than 92 percent of all facilities nationwide . Innovative Renal's administrator, Scott Sullivan, said the clinic had a difficult patient pool, but its most recent results have shown improvement. "We've put things in place to make sure those numbers are corrected," he said. The information void feeds patients' general sense of powerlessness. Even activists such as Peckham or Lori Hartwell, who heads up the Renal Support Network , a patient advocacy group, say they often feel shut out of the biggest decisions affecting the dialysis system. As a group, those on dialysis have been less vocal and effective than other patient communities in pressing a cohesive agenda. Kidney failure is almost four times as common among African-Americans as among whites, and about one and a half times as common among Hispanics as among non-Hispanics. 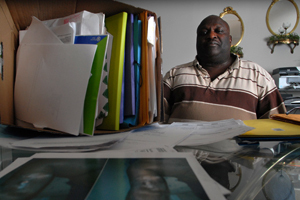 About half of the kidney program's beneficiaries are poor enough to qualify for Medicaid. Dialysis itself can leave many patients saddled with cramps, congestion and a sapping exhaustion. "You're a pile of mush that's barely getting through," said Cindy Miller, a former patient in Las Vegas who got a kidney transplant. "What do you want to do, file a class action? How many of these people are going to be alive long enough for that?" When patients do take on the system, they can pay a heavy price. Larry Hall came home the evening of Nov. 15, 2007, to find the equivalent of a "Dear John" letter from an attorney representing DaVita, his dialysis provider. "Effective immediately," it said, "you will no longer be treated" at Southeastern Dialysis of Wilmington, N.C., where he had been a patient for more than nine years. Enclosed "to aid you in finding a new treatment facility," the attorney wrote, was a list of non-DaVita facilities. The closest one was 50 miles away, in South Carolina. Hall had been dumped, or, in Medicare-ese, "involuntarily discharged." A burly, soft-spoken man who spent almost two decades as a uranium processor for General Electric, Hall, 51, was a hyper-vigilant patient who sometimes challenged clinic managers. Starting in early 2006, they pressed Hall to sign a contract that labeled him disruptive and required him not to "hand out anti-DaVita or anti-dialysis literature on the premises." Hall refused to sign and sued for negligence. The discharge letter arrived a few months later. A DaVita spokesman said in an e-mail that the company did nothing improper and blamed the discharge on Hall's "escalating disruption and behavioral issues." The clinic continued treating Hall even after he sued, the spokesman said, adding that while Hall later won a $10,000 jury award for one claim, several others were dropped. Hall was forced to seek treatment at the emergency room of a nearby hospital, where he waited hours for stations to open up and for tests to show that his condition was dire enough to warrant intervention. Once -- short of breath and swollen with 16 pounds of excess fluid -- he says he was refused dialysis. Hospital workers put him in a wheelchair and left him in the lobby. Regulators concluded that Southeastern Dialysis had violated Medicare regulations by dismissing Hall without advance notice. For now, Medicare officials have arranged for Hall to receive dialysis at the hospital. His treatments cost more than in-center care, and Hall worries the plug could be pulled at any time. "I don't know what's going to happen to me," he said. "I don't have nowhere else to go." Reggio Calabria is not the sort of town where you'd expect to find world-beating health care. Dusty and poor, it sits on Italy's southern tip, at the end of a notorious highway that cost so much and took so long to build that it became a national symbol of inefficiency and corruption. The city's main public hospital has the tired grubbiness of a bus station. Its unit for kidney patients, however, typifies dialysis Italian-style. 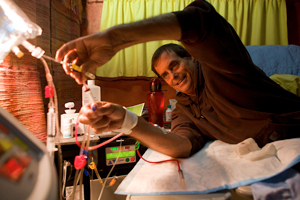 Other countries provide universal access to dialysis care, much like the United States. But some, notably Italy, have better patient survival and cost control. Italy has one of the lowest mortality rates for dialysis care -- about one in nine patients dies each year, compared with one in five here. Yet Italy spends about one-third less than we do per patient. These results reflect lower overall health care costs and a patient population with lower rates of diabetes and heart disease, but also important divergences in policy and practice. "The differences in mortality are staggering," said Dr. Daniel Batlle, who is a professor at Northwestern University's Feinberg School of Medicine and co-authored a 2009 paper on dialysis practices and outcomes in Italy. As Dr. Carmine Zoccali, slim and white-haired, weaves through the 24-station outpatient unit in Reggio Calabria, patients recline on beds, chatting quietly or dozing. A doctor is present at every session, adjusting treatments and handling any complications. This is typical: A 2007 report  showed that Italian dialysis patients had more than five times as much contact  with their physicians as U.S. patients. As Zoccali walks through the ward, nurses move between the beds, monitoring patients' vital signs and responding to the occasional bleat of a machine alarm. There are no patient-care technicians, Zoccali explains, and some regions set mandatory staffing minimums. His unit has at least one nurse for every 3.5 patients. Their expertise not only enhances safety, but also helps keep patients compliant with their treatment programs, Zoccali says. Most of his patients get three treatments a week, but their sessions last at least four hours, more than the U.S. average. Extending dialysis by 30 minutes per session improves life expectancy, research shows, though many patients resist adding time. Zoccali speaks wistfully of a French clinic where patients get 12-hour treatments and have lower levels of hypertension than people with healthy kidneys. "The decision to make dialysis faster wasn't a scientific decision, it was a managerial decision," he says. "It's to allow you to do four shifts a day and make money." He schedules just two shifts a day to accommodate longer treatment times. Zoccali and other doctors credit much of their success to the Italian practice of sending patients to specialists earlier than in the United States. There are fewer financial barriers to such referrals. Those with less-advanced kidney disease have equal coverage; patients don't need to have reached kidney failure. Intervening sooner "delays the need for dialysis and reduces the number of patients," said Dr. Francesco Locatelli, who oversees the nephrology and dialysis program at the hospital in Lecco, near Milan. The economics of dialysis are fundamentally different in Italy, where public hospitals still provide more than three-quarters of the care. Regional health authorities pay more per treatment than Medicare -- roughly 50 percent more , the 2007 report found. But per-patient costs are lower because Italy's indirect expenses, particularly for hospitalization, are smaller and because coverage includes drugs as well as dialysis. A 2004 study found that Italian patients got half the average dose of Epogen given to U.S. patients, perhaps because there's no profit incentive to give them more. Private operators have made inroads in Italy, especially where local health authorities have faced budget pressure. Areas with more private providers have so far had outstanding patient outcomes, but some practitioners think the statistics mask a more complex reality. "The private centers do the simple things, but when they have patients with complications, they send them to us," said Dr. Giuseppe Remuzzi. Remuzzi has presided over the dialysis unit in Bergamo, an industrial city northeast of Milan, for more than three decades. Poking his head into one treatment room, he introduces four patients, all seniors, who have been getting dialysis together for 17 years. A few doors down, Gianni Bertoletti, 57, a wry, mustachioed man with blue wire-rim glasses, is halfway through his session. 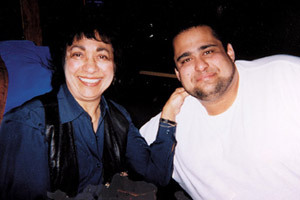 Bertoletti started coming to the unit in 1971. To Remuzzi, their longevity is proof that Italy should resist the U.S. dialysis model. "If we use the same system you do," he said, "our patients will start to have survival rates like yours." Despite the deep flaws in the U.S. dialysis system -- and the obvious ways that Washington could improve it -- big changes don't seem to be in the offing. Donald Berwick, the new administrator of Medicare and Medicaid, has not yet articulated his vision for the program, and health care reform leaves it largely untouched. The Institute for Healthcare Improvement , which Berwick co-founded, has worked to promote the use of fistulas, but a project director, Carol Beasley, has concluded that a piecemeal approach to fixing dialysis won't work. "It's unsatisfying to tinker with one broken part of a broken system," she said. Berwick, whom conservatives already accuse of supporting health care rationing, may not have the capital to push a more holistic approach. So far, he's taken the step of endorsing the government's move toward payment reform. Starting next year, Medicare will pay a combined rate -- about $230 per session, subsequently indexed for inflation -- for treatments, drugs and other dialysis services, removing the incentive for clinics to overuse drugs. The end-stage-renal-disease program also will try for the first time to tie pay to performance: Under a proposed rule that takes effect in 2012, clinics could lose as much as 2 percent of their Medicare payments if they fail to meet standards for anemia management and dialysis adequacy, as measured by patients' blood tests. Dr. Barry Straube, CMS's chief medical officer, called these just the first steps toward addressing ongoing quality issues in dialysis "in a serious and fairly rapid manner." Many industry experts doubt these changes will yield much. For one thing, they offer no financial reward for providers who deliver superior outcomes. Several observers also said the government is making a crucial mistake by rating performance by lab tests, not outcomes or measures that reflect patients' quality of life. "Mortality, morbidity, and infection -- that's the bottom line," said Joseph Atkins, the former clinic owner and consultant. "It's easy to adjust the labs. What good is it if you have good numbers, but everyone's dying or in the hospital?" Increasingly, patients, doctors and advocates say that the way forward lies in focusing on alternative therapies, particularly those, such as home dialysis, that allow for longer and more frequent treatments. 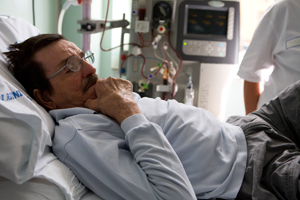 The biggest potential gains may rely on keeping people off dialysis in the first place. In that, the United States is falling miserably short. The incidence of kidney failure has increased by more than 80 percent since 1990; of the 40 countries that share data on this, only Taiwan and parts of Mexico have higher rates. "The centers are kind of the end of the line," Beasley said of dialysis providers. "They could deliver perfect care, but you still would be dealing with this tidal wave of people" coming into treatment. A potential bright spot in health care reform, she said, is that extending better coverage to persistently under- or uninsured Americans could lead to earlier intervention for kidney disease. But as care expands and the national health care debate staggers on, our four-decade experiment with dialysis is worth bearing in mind. All too often, patients get caught in a vise between bureaucracy and the bottom line. As dialysis shows, guaranteeing access can come at a steep price -- in dollars and in lives.